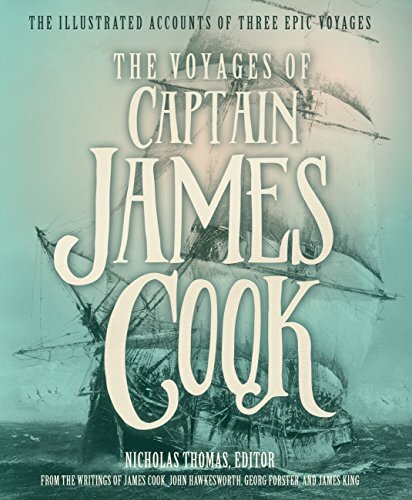 From 1768–1780, Royal Navy Captain James Cook commanded three exploratory cruises that are still considered some of the greatest scientific expeditions of all time. Not only did Cook navigate and chart vast swaths of the Pacific, discovering numerous islands and civilizations previously unknown to Europeans, he chronicled his journeys via a collection of logs and diaries that form the basis of this intriguing volume. In addition, Cook charted and explored the previously unknown eastern coast of Australia and conducted a complete charting and circumnavigating of the islands forming New Zealand. Using the journals of Cook and several of the scientists that accompanied him on these voyages, Nicholas Thomas has created what will probably be the definitive account of Cook’s journeys, finely illustrated with contemporary paintings, drawings, and maps as well as current photographs of the scenery and Pacific islanders still living in places like Tahiti, Fiji, and Tonga. Cook’s logs and journals show both the business side of a Royal Navy Captain and the inquisitive mind of an explorer trying to describe what for his European crew would have been strange and exotic people living a primitive lifestyle. The ability of Cook to navigate and chart the islands he encountered is remarkable for any sailor to comprehend, given the fairly rudimentary navigation tools and knowledge available at the time, and he kept a very comprehensive account of the islands and locations visited by his crew. While many books have described Cook’s visits to Australia, New Zealand, and the Pacific Islands, this volume gives equal coverage to his other explorations, particularly his efforts to find and map Antarctica during his second voyage and his attempt during his final voyage to find the elusive Northwest Passage around the northern edge of the “New World” that would eliminate the need for a long and hazardous voyage around South America to get into the Pacific. While these voyages were less than successful, Cook nonetheless made many pioneering explorations of the edge of the Antarctic Continent and the Alaska coast. The descriptions of the encounters with the many indigenous people Cook encountered provide a great deal of the narration. The vessels needed to put into shore often for provisioning in addition to the exploratory efforts, and the Europeans encountered a wide range of native welcomes from indifference to curiosity to outright hostility—all of which are described in great detail in the journals and logs. Many of these tribes had rituals and societies considered scandalous to 18th century European sensitivities, and one amusing note is that the journal of the first voyage published by John Hawkesworth was considered licentious for its descriptions of native sexual behavior. Cook did not survive his final expedition, dying at the hand of natives in what would become Hawaii. But his legacy of exploration, and more importantly, the published accounts of the wonders of the Pacific, directly contributed to the colonization of Australia, the launching of missionaries to many of the atolls described by Cook. The editing of this volume is seamless and outstanding. Thomas has allowed the explorer to tell his own story, combining history, cartography, natural science, and a bit of a modern travelogue to provide what should become the definitive memoir of one of the greatest explorers in history.